Earlier this year, SABR's Women in Baseball Committee established the Dorothy Seymour Mills Lifetime Achievement Award — "The Dorothy" — named in honor of Dorothy Seymour Mills and her lifetime of contributions to promoting women’s baseball. Eligible candidates include any person with a sustained involvement in women’s baseball or any woman with a longtime involvement in baseball in any fashion — player, umpire, writer, executive, team owner, scout, etc. Candidates do not have to be living; it can be awarded posthumously. Self-nominations are accepted. For more information on the award, click here. 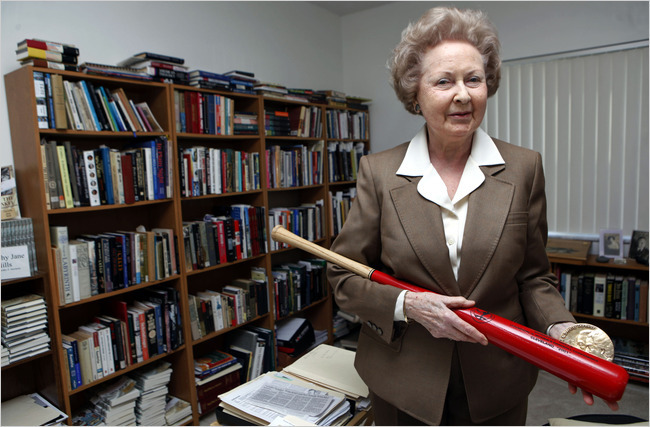 To learn more about baseball historian Dorothy Seymour Mills's life and career, click here. This page was last updated December 19, 2017 at 12:35 pm MST.